When defining a gradient fill in Blend, the Offset property of each gradient stop indicates the location of the gradient stop along the gradient line, from StartPoint to EndPoint. In the example below, the gradient runs from white at the top of the control to blue at the bottom. 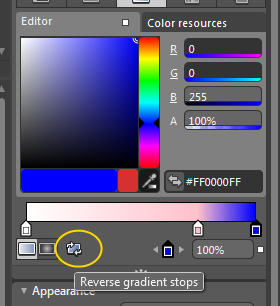 You can easily reverse the order of the gradient stops by clicking on a button in Blend. The button is located on the color editing panel. If we reverse the gradient stops for the example above, the offsets are reversed and the gradient flips upside down.